Recently, my network of informants alerted me to some unusual happenings in the Valley of the Spine, which may have been connected to a previous line of inquiry. Several months prior to this I had been asked to follow up on a Silt Cleric by the name of Abdaleem, whose last recorded contact with the outside world had marked him as a possible candidate for becoming an advanced being. I searched the area in various alter egos, asking about any unusual elemental activity. My quest for the silt priest proved fruitless, and I was hesitant to enter Old Giustenal myself, full knowing about its dark lord and the Caller in Darkness. However, my failure was leavened by rumors of an ancient temple in the Valley. Before leaving, I procured some agents, through psionic and financial means, and left them instructions to find this place. The details were promising: the Gray Rovers, a local slave tribe, had unearthed an entrance to a ruin that could only be a Green Age Temple. The Rovers leaked the news to no one, as their Tarek leader apparently anticipated some salvageable treasure and feared his rivals, the Dust Vipers (an elf raiding tribe), finding out. They were also waiting for the tribal shaman, as even the most stubborn mul could feel the elemental power coursing. Needless to say I was elated, for two reasons. One, a possible ascendant elemental might lie below waiting, and two, if there was any risk of confrontation, the small number of Rovers would make overpowering them relatively easy. Using Psychoportation, I was there within an hour. With some basic Telepathy, I was experiencing the site through the shaman's senses. Now all I had to do was wait as the ex-slaves below mustered the courage to open the entrance. As soon as the massive stone gate was opened, a cool, refreshing breeze washed over the Rovers. Some of the younger warriors broke out in relieved smiles, as their fears evaporated. As they relaxed, that is when a rancid odor washed over them, a nightmare combination of rot, mildew, and stale water that I had previously had only smelt in the verdant jungles of the Forest Ridge. As the Rovers readied their weapons, a hysterical scream leapt out of their throats, as a horde of damply rotting creatures threw themselves into the huddled mass of humanity. By the time I had recovered my senses, the Krags had slain most of the would-be tomb robbers and were preparing for a last assault on the shaman and the lucky few that were shielded by his power. I watched the undead rend the flesh from those last few unfortunates with admirable dispassion. As the Krags retreated back to depths of their lair I followed, psionically rendering myself as stealthy as a prowling halfling. I felt a momentary surge of panic as the gate closed behind me, but I recovered and went on. The Krags and their attendant Kraglings, paced like feral beasts as I passed silently, the coppery smell of the red blood coating their claws and fangs filled my nostrils. The temple itself was a marvel, the interior built entirely of white marble. The floor, ceiling, and walls meshed perfectly at right angles and the examples of ancient writing and artwork would prove priceless to the right collector. However this awesome display of grandeur had its faults, as well. First off, it was damp enough to coat almost every surface in some form of mold, slime, or fungus. This made for an uneven footing, which was compromised by the multitude of vermin crawling, leaping, and squirming underfoot. The smell, well, I'll let you keep your lunch and not describe to you in full that ordeal was. Lastly, the temple itself was in poor condition, with only the central hall and the "grotto" being in relatively good condition. The grotto was at the end of the hall; perhaps a good 75 feet down its length. The chamber seemed to be a natural cavern, about 30 feet in diameter, although I suspect it was created after this building was buried by time and the wandering sands. In the midst of this chamber, a pool of aquamarine water, breathtaking in it's serenity, lay expectant. I knelt by the edge, intent on piercing the mystery surrounding it when reality shifted. I know it is a most imprecise term and I wish I had a bard's gift for wordsmithing, but one moment I am by myself in a silent ruin and the next I am in the presence of something far greater than myself and I hear the Krags crying their short, gurgling wails. There was a time in a prior life when I was a small boy hunting for a smaller tribe and I came across a lion and I knew, in my childish mind, that I was hopelessly outclassed and I would most likely become a meal for the great beast. The creature watched me languidly, and I could almost perceive it watching me with contempt, as if I would not measure up to the effort of killing me. I ran home that day, a frightened and ashamed child, who was grateful he was alive and would never again place himself in a situation where he had no control. This was one of these situations. I could feel a greater power slowly gathering itself in the cavern, and I had no wish to bear responsibility, seeing as I would most likely be outclassed (a most rare occasion these days), I simply fled, as a dead man can not report back to the Order. When I recovered from the mild disorientation that teleportation brings me, I found myself in a safe house in Nibenay, my adopted city. I felt a bit of discomfort from my near miss, but after witnessing the raw power that just one of these beings wields personally, I know why our fraternity must forever pay the ascendant the closest of attention. A follow-up report will be sent in a few weeks through the usual channels. 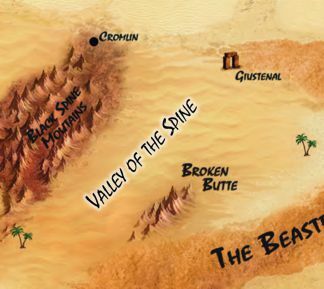 The Valley of the Spine is located South of the haunted ruins of Giustenal, between two mountain ranges. The Western range has been dubbed the Black Spine (these gith-infested peaks are detailed in the adventure of the same name), and the locals call the Eastern range Chalath's Teeth or the Broken Butte. The valley itself is a twisted maze of rocky badlands, dust sinks, and shifting sand. Several villages, both independent and client, lie here, their existence dependent on the mining and quarrying that lured their predecessors here long ago. Despite their meager existence, several raiding tribes lurk here as well, secure in the relative remoteness of the area. Slave tribe's dot the area as well, locked in a struggle to survive without resorting to the depravities that they had escaped from. Giustenal, the ruined home to the entity known as the Caller in Darkness as well as darker horrors, is detailed fully in the City by the Silt Sea accessory. The ruins were the remains of a Green Age temple, buried by the vagaries of time and nature. The only entrance is a massive stone gate that opens from the inside. Inside, a seventy-foot long hallway leads deeper into the earth, littered with broken pillars and choked with rubble from collapsed side tunnels. It was once a place of wonder, opulent in decor, and perfect in form. It is now a sodden environment, and a pungent display of molds, slimes, and other lesser fungi grow in a riotous bloom. Insects, reptiles and other vermin lurk in the shadows, crawling over everything in their awkward haste, intent on their next meal. Lurking in the hallway as well is a pack of eight krags. These pitiful remnants of priests are an especially lethal threat, as the ascendant elemental keeps them here, bound to his will. Unable to abide their fecund environment nor their new master, the krags are prone to forgoing their elemental attacks in lieu of the temporary release of rending flesh with their claws. Attending the Krags are a sizable number of Kraglings, thirty in all. They are as vicious and mindless as their masters are. At the end of the once opulent hallway is a cavern thirty feet in diameter called the Grotto. It appears to be a natural construction, but further investigation will bear that no natural forces created it. In the center of this cavern lies a pool of clear fresh water, ten feet wide and very deep (in fact it is a portal to the elemental plane of water). The Grotto projects an air of tranquility, and any action to break this tranquility will result in Tsaroth's (the elemental) return. He is not at all subtle about his arrival, and the party will feel a vast, foreboding presence long before he actually arrives. It will take a half-hour for Tsaroth return to his home plane. And if finds any living being still present, he will attack without mercy. The Silt priest that Niklas was initially looking for, is described in CbtSS. The locals who knew of him do not know his whereabouts, and nor are they interested in searching for him, claiming that he was a threat to the area. The truth is, after Dregoth, the dead king of New Giustenal, was awakened to the outside world, he soon ascertained of the Silt priest lurking in the submerged sections of the surface ruins. Abdaleem was ambushed and captured by a team of Dregoth's templars, and soon he was submitted to the personal attentions of the dead king himself. As a hermit, Abdaleem did not have much in the way of useful information of the Tyr region, and Dregoth abandoned the broken husk of the Silt priest to the predators of the fiery cavern of Kragmorta, where he was promptly eaten. A small slave tribe numbering around thirty, the Gray Rover are primarily escaped quarry slaves, and thus muscular races, such as muls, dwarves, half-giants, and tareks count among its membership. They supplement their minimal survival skills with frequent raids on Nibenese supply caravans. They are very successful at this endeavor, and have become something of a legend in the quarry pits of such outposts as Oblivion, Hareshent, and Kor's Hole. They are also locked in a deadly rivalry with the Dust Vipers, and they frequently clash with deadly intensity. Their current leader is a Tarek by the name of Belraag, a hulking brute who leads his tribe with a fanatic's zeal. Outsiders know little else. An elf tribe who range west of the valley, the Dust Vipers often send raiders in to rustle up some trade goods as they travel between Nibenay and Raam. They are organized like a typical elf tribe, their leader being a defiler named Kirzan. His most capable lieutenant and war leader is his half-brother Ryin Black-Knife, a fighter/psionicist with a propensity for Psychokinesis. The ascendant elemental in the temple once went by the human name of Tsaroth, but this was in a time when the horrors of the cleansing wars were still fresh in the memories of the elderly. After reaching 30th level in a grueling ritual, he promptly began to explore the manifold mysteries of the inner planes. To this day, he still is. It has been a long time since he has seen a mortal and as the centuries grind by, he is slowly and irrevocably losing his humanity. Today, he is an elemental in thought and deed, and he remembers little of his prior life save for endless sorrow and loss. He is uninterested in Athas, and he responds to any intrusion on his domain with deadly, if blunt, force. The Rovers suffered a distinct setback with the defeat of their exploration team. This is an opportunity that the Nibenese, their primary targets, could exploit ruthlessly. The party could be hired as scouts for the teams assigned to run the slaves down. Or, the Rovers could try to woo the PC's to their camp, promising shares of caravan loot in return for their protection. Of course, this scheme would only last as long as Belraag can keep his pride in check. With the Rovers weakened, The Dust Vipers may finally get a chance to start preying on the Valley full time, without fear of the hit-and-run raids of their hated enemies. If the going proves profitable enough, the elves would move in, not saving their raids for slave owners alone. Once again, PC's can be employed in a variety of positions, from village guards to mobile response teams. The temple itself can be used as a unique backdrop, or the PC's could get involved with the initial Rover excavation. If they survive the initial encounter, they may excavate some of the side passages, which could lead to some of the following: patches of dangerous molds and fungi, a prayer room inhabited by a talkative Raaig, a treasury that has several gas traps as well as a pair of stone golems, or the remains of a long dead knight, whose armor and weapons are heavily corroded, except for an intricately carved sword . . .